S-100 Finish Remover is an environmentally friendly water-based solvent that removes many oil and water-borne finishes from logs, siding, and decks. Perma-Chink Systems developed a finish remover using new technology originally developed for removing paint from aluminum aircraft surfaces. Supplied as a ready-to-use gel, it is easily applied with a short bristled brush, paint roller, or airless sprayer. Within a few minutes it begins to soften the finish and since it is a gel, it stays wet and active for a fairly long period of time. Once the finish has sufficiently softened, it can be removed by simply pressure washing. S-100 will not darken or discolor the wood, will not corrode or discolor metal surfaces, nor will it harm log home chinking or sealants. 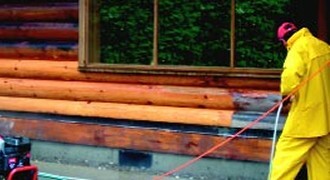 Although it is effective for removing most log home finishes, there are some high performance coatings that may require a more aggressive chemical stripper. Perma-Chink Systems recommends that a sample of S-100 be obtained from them and tested on the finish you want to remove prior to placing an order. Safety equipment, bucket, brush or roller, paint scraper, rags, and pressure washer capable of generating at least 500 to 600 psi.